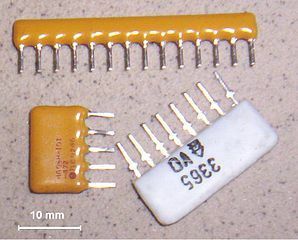 Did you know there are many types of resistors? 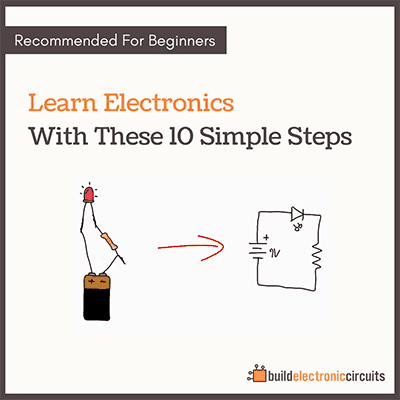 Your electronic schematic tells you that you need a resistor of 100k Ohms. Ok, so you go to an online store to buy one. But there you get all these choices: Thin film, carbon composition, metal film +++. “Just give me a freaking 100k resistor man!”, you scream in despair. Believe me, I know your frustration. It took me a long time to actually bother reading about different types of resistors. So I just chose random resistors for all my electronic circuits. Usually it worked flawlessly. Maybe I was lucky or maybe I just didn’t identify the resistor as the problem when I had a problem. Anyway, my aim here is to provide a simple guide on how to choose a resistor without diving deep into details. The different types have different properties. Some are very accurate, some can withstand high temperatures, some can withstand high power and some are cheap. Some are good for low noise applications, some are good for high-power applications, some for high-speed applications and some for measurement circuits. So, how do you choose a resistor? where P is power in Watt, V is the voltage drop over the resistor and R is the resistance of the resistor in Ohm. 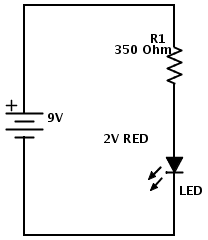 In this circuit, we use a LED with a voltage drop of about 2V. The resistor has a value of 350 Ohm. It is powered by a 9V battery. How much power will dissipate in the resistor? Learn how to calculate the resistor value you need for an LED. To answer this, we first find the voltage drop over the resistor. Let’s say we use a LED with a voltage drop of 2V. That means the voltage drop over the resistor will be 9V-2V = 7V. Using the formula for power dissipation, we find P = 7V*7V / 350 Ohm = 0.14 W.
So we need a resistor with a power rating of at least 140 mW. But preferably more. A rule of thumb is to find a resistor with twice the power rating. Here I would choose a 250 mW resistor, since those are the most standard ones. Usually, you can just use the cheapest resistor you can find with the correct power rating. When to choose a non-standard resistor? Which resistor type to choose for which application is beyond the scope of this article. 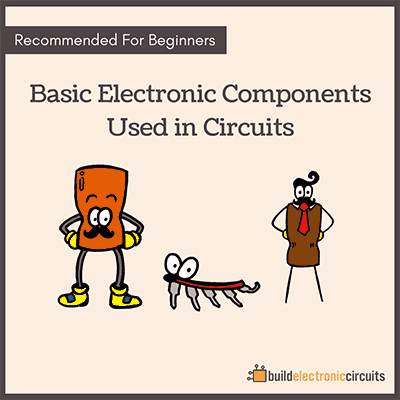 If you are building any of these types of circuits, see if the schematics specify the resistor type. If not, maybe this article can help you out. For most standard circuits, you don’t need to worry about the types of resistors you choose. All you need to worry about is the resistance value and how much power it can take. Do you think it’s hard to choose a resistor? Write your comments and questions below! Kindly I want to know about what effect on wattage if we use resistor in series and also parrlle please explained by example…. The formula for calculating power is the same in parallel and series. An additional reason for using a non-standard resistor that you don’t mention in this article is implied by the picture you use for that section, which show multi-lead resistor networks. Typically the resistor networks are a package of resistors where one end of each resistor is connected to a common lead, and the other ends are all separate. A resistor network is especially handy when building an audio mixer, for example, because each input typically has both a potentiometer (to adjust level) and a fixed resistor (for isolation, or to set a maximum input, I guess) for each input. Using resistor networks in cases like these simplifies wiring for both breadboards and prototype printed circuit boards, and reduces assembly time even for custom PC boards. Provide a bit more info on what is power dissipation ? It is how much power that is lost from the circuit at that component. Usually in the form of heat. How can you find out what the power dissipation is? could you explain me what is standard and non -standard resistors and also about the tolerance of the resistor? Hi there I have a couple of questions for you about resistors with capacitors. I have a capacitor and I’m trying to use it with a home made water battery. The water battery makes 1.6 V but it drops to 0.1 V when charging the capacitor. So my question is what resistor should I use. My second question is do you know whether voltage drop is the problem because the circuit worked earlier during testing. For you first question on what resistor to use, that really depends what you are trying to do. And I don’t really understand your second question, because I don’t know what circuit you have and what the problem you are experiencing is. Please explain, and I’ll try my best to give you an answer. this is the best article what i have ever read. it solved my every problems. thank you very much and all the best. The article is fantastic but you did not explain as to how 47ooo ohms converted into kilo ohm (Dividing the figure 47000 by 1000) but what about wattage of 0.14 watts into 140 mili watts (Perhaps by multiple of 1000). Any how a great contribution. All the components in a circuit are mostly not available in every country, hence I am un-able to proceed ahead to make simple circuits (DIY). Can I know the function of every type of resistor you label above? My first guess as I was reading the article was that some resistors would be good for high temperatures. I didn’t think that a resistor could affect the speed of the application. I remember learning about resistance in high school. I had to rely on the help of a classmate to finish the project. what resistor should i use for a motorcycle? I need 36 volts or less. I have never worked with motocycle electronics, so I have no idea. Maybe someone else can help? Sir, how can i known that which value of resistor is choose for circuit design. Means many type of resistor are available, which one i pick? Sir, How I can make a battery full charged indicator? I mean wihout harming battery by over charge. Can you send me a PDF that I can make a battery full charge indicator. Dear Sir, I have sony old Tape/ FM stereo model CFS- 210S. I tried to add audio in but it was very noisy even after set volume at the lowest level of my phone. I got some info from the net & found that there should be add resistors. I tried 47kohm , 56kohm & 68kohm. by adding these resistors my concerns was solved by 70%. Now i can open the volume at the 50% which gives full out put to the amplifier but still i can’t put at the highest volume level & if i do there is sound tear because its giving full sound till half volume . Please help which is the right resistors for this sony model amplifier. Good day sir, i’ve greatly learn alot in this ur article God blees, pls sir, is anything like filter and outputoutput capacitor, if there is what is the different between the two and how can I identify them .thank u. Thank you for the very helpful website. I salute you for your patience in comments. what is the rule of thumb? I real learn alot thanks Admin. please give complete information about PCB used in charger and i want to know how we can construct our own circuit for the PCB . Why we are placing a particular values of resistors and capacitors on PCB ?? 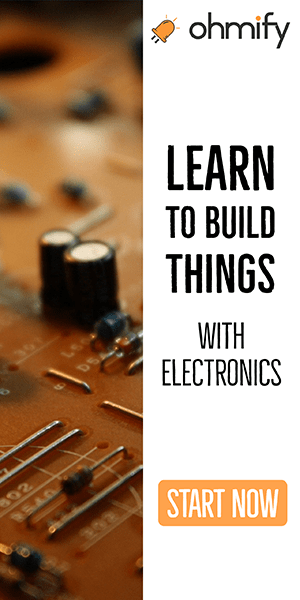 please tell me how can i construct my own circuit , to construct what i have to learn . please tell me . I saw that you made an atuomatic night light and that you used a 470 ohm resister and a 10k ohm resister. Why do you need two? Why can’t you just put a 330 ohm resister between the led and the transister, because in all of the other projects I have used with a 9V battery I used a 330 ohm resister between the bat and the led. Also how do you know to 10k and 470 ohm resister and not a different value? In the automatic nightlight one resistor is there to control the current through the LED. Both a 330 and 470 would probably work (depending on what LED you are using). Can I know the difference between 370 ohms and a 100k ohms resistor. Will the 100k Ohms resistor be resisting more current? Can you explain this? Yes, you are right. More resistance means less current. How do you calculate the power of a resistor in voltade divisor circuit. For a resistor, take the voltage across the resistor and multiply it with the current flowing through it. A resistor with 1V across its terminals and 1A of current flowing through it will have power dissipation of 1W. You can also use ohm’s law to make variations of that formula. How To Choose Types of Solder to Use For Electronic Circuits?